We believe that it is extremely important to know what choices you have, how your choices will affect you and which option to take. Informed decisions can lessen the risks of complications. It is for this reason that Maria’s Best Care strives to inform clients about the choices available for themselves or their elderly loved ones. 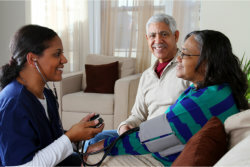 For many years, we have been in the practice of caregiving. The senior individuals in our care have become part of our profession. More importantly, they have become part of our family. We consider ourselves compassionately obligated to fulfill our professional role by being the caregivers we are expected to be: kind, considerate and patient. We are caregivers for a reason. We bring life to that reason by exhibiting quality care through our services at Maria’s Best Care. Maria’s Best Care anticipates your arrival. We hope you will be moving in soon.